We all have our quirks. I know I do. Typically it takes months and years sometimes to learn all of our leader’s quirks. What they like, what annoys them and ( most importantly ) how they uniquely define a rockstar top performer. We stumble our way towards discovering what our leaders value through trial and error which can be slow and painful. Around here our motto is “Speed Wins” so with my last batch of hires, I thought I would try something new and avoid the long process of letting the new members of my team figure me out the hard way. Instead, I would put it all out there by being completely transparent, honest and candid with them right from the get go about me. So, to help me do that, I wrote something I call: “The Blueprint to Luc and his Quirks“. Now, judging by the reaction I get when I tell people about the blueprint, I know this is a little odd. New employees don’t typically expect to sit down with their leader on day 1, be handed a blueprint and then walked through what their leader values, dislikes and what their quirks are… but I’ve found it to be a refreshingly open and incredibly efficient way of letting your new recruits get to know you at a level that some employees never get to know their leader… and smart, rockstar employees thrive on that openness. So, what is this blueprint? 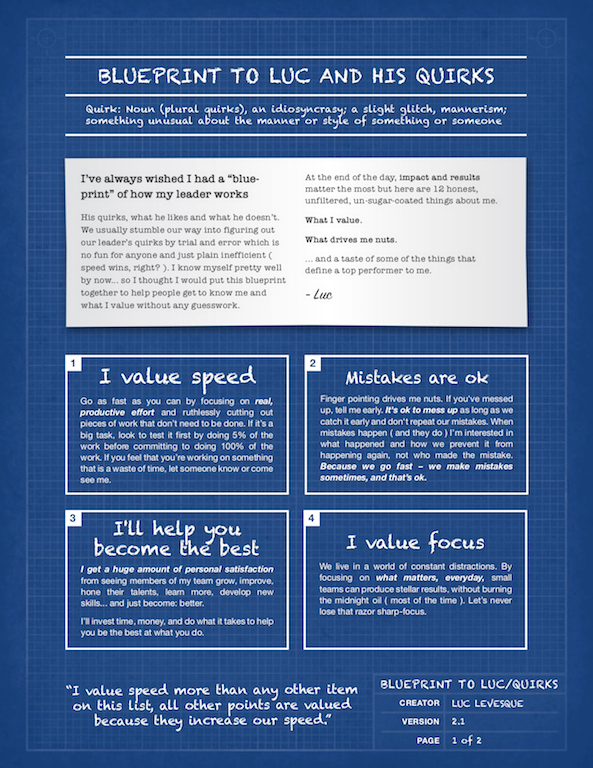 The blueprint is a brief 2 pager that outlines a few of my quirks. Ultimately, don’t we all want to know what our leader values? That’s what the blueprint does. It communicates clearly to the team what I value. Wouldn’t it be great to have a blueprint for all of our leaders ( and colleagues, friends and spouses for that matter! )?!?! I recently shared this with Harley at Shopify and he suggested that I open-source the blueprint, so here it is. Fill in each of the boxes with quirks you’d like your team to know about you, things you value and things that drive you nuts. If nothing comes to mind, do what I did and start by asking your team to tell you what they think your quirks are. If they’ve been with you for a while, they’ll know. Feel free to add to the blueprint template or to modify it however you’d like… and please leave a comment on this post to let me know what you think. I hope you find it as useful as I do. Everyone appreciates openness and honesty, from what I’ve seen to date, I think your team will too. UPDATE: A few people have asked if I just email the blueprint to the team. No, I don’t. I sit down with everyone on my team, one-on-one, we and talk through the blueprint together. There’s a subtle difference but it’s hugely important. By talking through the blueprint, face-to-face, it gives me the chance to answer questions, add context and refine the message specifically for that individual. I find it’s the discussion that the blueprint facilitates that’s most valuable. In fact, simply emailing the blueprint to your team might actually cause more harm than good because it’s possible that the intent is misinterpreted. As we all know, tone & body language communicate 80% of the message, the written blueprint just makes it easy to have that discussion. This is soooo obvious! Yet we forget about these details. I mean, of course it’s important for an employee to know about his boss’ quirks. Calls, e-mails, texts? Bullets or detailed when facing a problem? Confirm at every stage of a project, or let’s discuss it when it’s done? Never bother me on a conference call, or clients are my priorities and feel free to knock if I can help you. The list could go on and I will clearly use this in the future. thanks! thanks for your chat this am. This is so counterintuitive… Thanks for sharing! I wish my last boss would have done this. Total communications block! Thank you for your generosity! It’s been 3 years since your last comment…are things still working as well now as when you wrote and shared this message to us? You bet… still doing this with all new hires. Works great.